I love to jump around from one medium to the next, it keeps my mind fresh – I just go with whatever I am inspired for. Keep reading below as I show you some of my art in different mediums …. PASTEL PENCILS – When I started getting more into drawing and playing with art media was when I began my family 18 years ago. I dabbled with acrylics at first which I will mention more about below but then turned to pastels. At first I loved oil pastels, I had just a cheap set of 12 from Kmart. I started to develop my skills with these and did several commission portraits during that time. Unfortunately I couldn’t get anymore colours than a 12 set in that brand, I think it was Micador. Other oil pastels I had tried weren’t the same, Micador were creamy and easily smudgeable. My parents gave me a set of Faber Castell Pitt Pastels for my birthday, I tried them and I found them so hard I just couldn’t get them to work the same as the oil pastels so I put them down for some time before I picked them up again and had another go at them. I kept at it and after a while I started to understand how to use them. I continued to develop my skills with them for many years, I also continued with commission work for clients in Australia and overseas. Below are some of my earlier pieces of pastel pencil work. My favourite pastel pencils are Faber Castell Pitts and CarbOthellos (even thought they do break and drive me crazy!!). To blend I mostly use my finger, if the area is too fine I would use a tortillon. I’ve always enjoyed painting animals, love to capture their eyes and fur. Sometimes I would experiment with limited palettes and occasionally I would go beyond the traditional portrait and create fairies. ACRYLICS – When I was pregnant with my first son I joined a folk art class with the very talented teacher Debbie. She taught me a bunch of techniques while we painted decorative wood pieces. After my son was born I found it hard to paint with the demands of mother hood so then turned to pastels for their ease of use. In the last couple of years I have been painting with acrylics again. I believe you can achieve similar results to using oils but without the delay of drying time. I want to paint so much more with this medium! Below is some of my acrylic work . I use Atelier Interactive acrylics and Jo Sonjas. OILS – I remember having a go with oils when I was pregnant with my second son. Is there something about being pregnant and discovering new art!! Seems to be a pattern here lol. I really had a hard time with morning sickness and the smell of the oils and linseed oil became too much for me. In the last couple of years I have painted a couple of pieces but I am a bit too impatient waiting for them to dry. Below are the few oil paintings I have done. Painted with Art Spectrum oil paints. WATERCOLOURS – Watercolour pencils have a level of control about them whereas watercolours paints are somewhat trickier I find, but that’s what I like about both of them. Below are examples of my work, the top 2 with watercolour pencils, and the bottom 2 with watercolour paints. I use Derwent Watercolour pencils and Winsor and Newton watercolours. I would like to expand my range of pencils at some stage. COLOUR PENCILS – By now you have noticed I really like pencils in all forms. A good quality pencil on a good quality paper makes a fine art piece sing. I still have to experiment with more papers but I do like vellum. Working as a tattooer has involved a lot of colour pencil use for preparing tattoo pieces. Tattooing has taught me to think outside the box more and be more creative with my drawings, just like the last 2 drawings below. On the occasion I have included markers with coloured pencils amongst other pens – mixed media. Prismacolour Pencils are a favourite of mine and I also use Faber Castell Polychromos. GRAPHITE PENCILS – When I draw with graphite I like to get creative. I love to take an interesting portrait and recreate it into something unique, just like these drawings below. First drawing is Daisy – my idea was the girl with a daisy in her hand, within the shape of a spade, with daisy’s throughout to decorate, it developed as I went along. Second drawing is Death Lily – I could see a day of the dead girl with a death lily flower and lily’s in her hair, the reference for this one was of an older lady. Third drawing I call Kitana Love – she was my kitty who died in 2013, I wanted to put her face in the shape of a heart with flowers for love. Fourth drawing is Alessandra – the reference had the lady looking over her shoulder. I imagined a tattoo on her shoulder, a cigarette and feathers and a simple designed shawl and gloves – a cabaret dancer. I generally draw with a HB and 4B or something along those lines – one light shade and a darker shade for depth, no need for a whole bunch of shades, I can accomplish what I am looking for with just the 2. Mechanical pencils are awesome too, very fine! All blending is done with my finger. Tattooing found me almost a decade ago. I had to learn how to approach art differently. When I do my fine art pieces I always start with my mid tones and work up to the darks and lights. 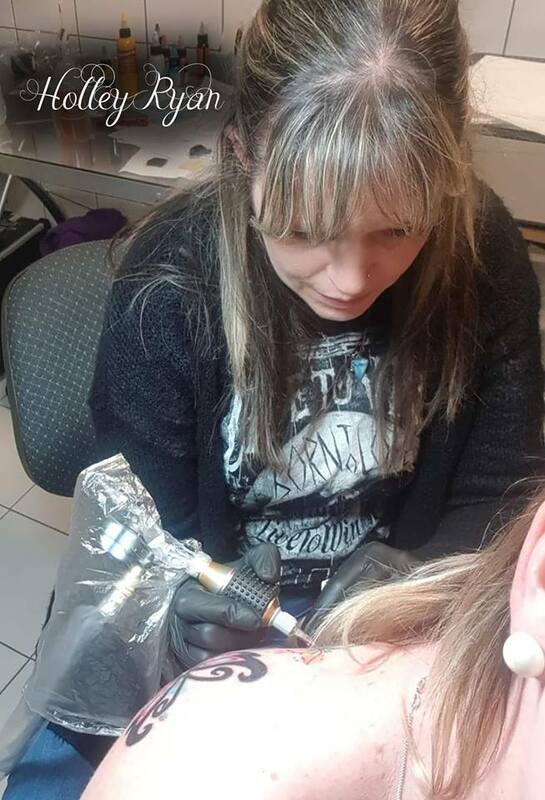 With tattooing I had to lay down my darks first, it took me some time to get my head around working that way but over the years I developed my own way to ink. I have tattooed a variety of work including some of my own drawings. Below are examples of my custom tattoo work. I enjoy both black and grey and colour work, often being asked for watercolour pieces. Just over 2 years ago I bought a crochet magazine from the newsagent – it had a build rocky bear as the project inclusion which is what sold it to me. At the time I thought to myself ‘do I really need another project that I just won’t have time for?’ the answer of course was ‘YES’ haha!! I had never crocheted before so had no idea even how to do it! My daughter and I sat down and tried to follow the directions in the magazine but it was when my partner came up to us with his phone linked to youtube with tutorials that it began, why didn’t I think of that lol. Back then I didn’t know the impact this craft would have on me, I am now totally hooked!! I’m enjoying the journey of learning different stitches and challenging myself. Below are some examples of things I have made, I like to stick to smaller projects as I am more likely to keep interest and finish them.